I originally was not signed up to run this race. I had intended to ONLY run the Half Marathon this weekend and nothing more. Then runDisney had to go and announce that all their 5K medals would be actual medals and no longer rubber. Then they had to go and release the 5K medal, I instantly wanted the 5K medal more than the half medal thanks to Mrs. Potts and Chip. Unfortunately the race was sold out so it wasn’t looking like I was going to be able and run this race. 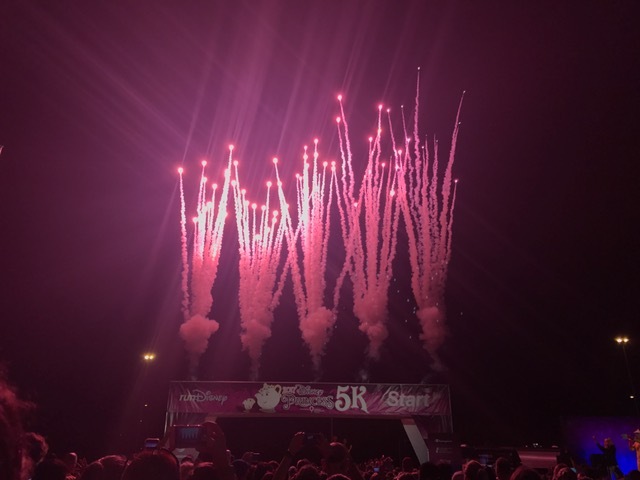 Now remember back to the 2017 Walt Disney World Marathon expo where I was fortunate enough to get into a (supposedly) sold out race thanks to the runDisney booth, and just like that I was on my way to running the Princess 5K! Mike and I called a last minute audible and decided to cancel our flights and drive to Florida. “Why?” you may ask. We decided to stay off property for this race weekend, which involves needing a car and rental car prices were outrageous for this particular weekend. We realized we would spend quadruple the amount in renting a car, parking our car at the airport, and gas then if we were just to drive down. 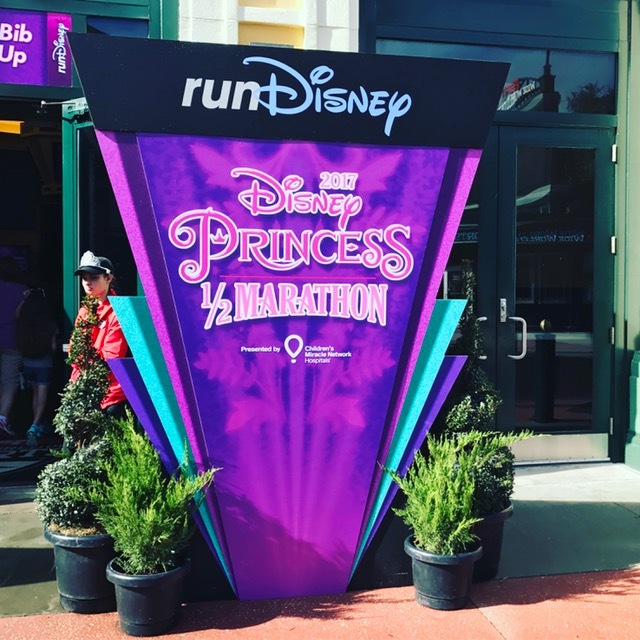 You may ask why the rental cars were expensive this particular weekend…well I remembered back to other Princess race weekends and realized it is almost always more expensive to rent a car this weekend than all other runDisney race weekends. I finally remembered it is because Princess weekend falls the same weekend as the Daytona 500 so two very large groups of people are vying for rental cars. We can add the Gasparilla race weekend in Tampa in the mix as well. Add it all up and the rental car prices were more expensive than what we wanted to pay. 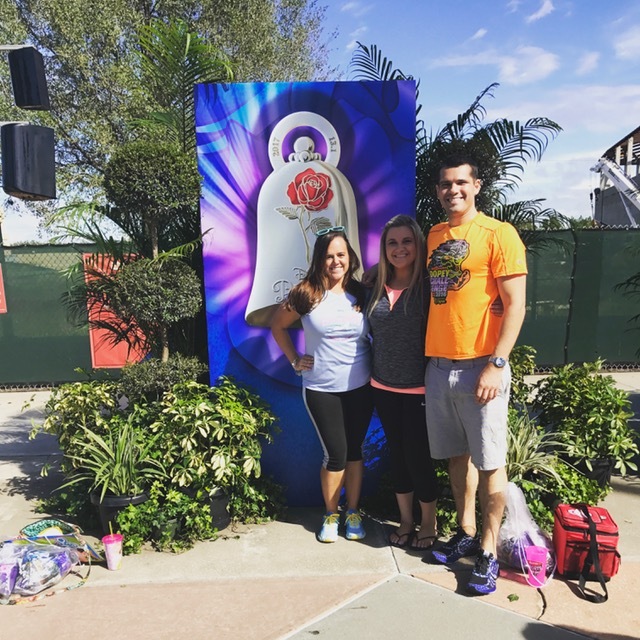 I planned to go to the expo early with a few of my running buddies…early enough to wait in line for the craziness that was going to be basically be Black Friday runDisney style, all for this year’s coveted shoe ornaments that are being specifically designed for each race weekend. 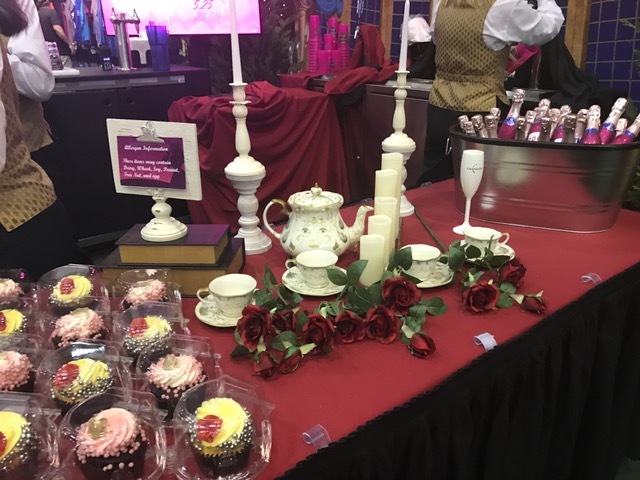 We arrived around 9am with our sparkly princess cups and our McDonald’s breakfasts to discovery lines that were already with princesses waiting to get into the Josten’s Center for merchandise (keep in mind this is in a different building than bib pick up). We noticed that the signage, however, had been replaced to the “J Center,” so we are guessing there was a sponsorship change since Marathon weekend. After braving the merchandise it was time to move on to bib pick up in the H.P. fieldhouse. Unfortunately after I picked up my bibs for the half marathon and 5K I had to head back over to Josten’s, er, J Center to pick up my race swag. It’s now time to discuss “Shirt Game.” This is something new I’m adding to my race reviews thanks to the “Not Real Runners” John and Sara. Shirt Game refers to what previous race shirts are being worn at the expo. I chose to go with my Inaugural Glass Slipper Challenge shirt this day. In wearing this shirt it basically advertised that I’ve been running this race weekend for a long time so other runners could feel free to ask me questions because I can probably help you. Other Shirt Game I saw around the expo included lots of Princess weekend shirts from various years, a heavy dollop of Marathon weekend shirts, and of course those pesky talented runners proudly sporting their Boston Marathon finest. Every time I see them I have equal parts respect and envy! 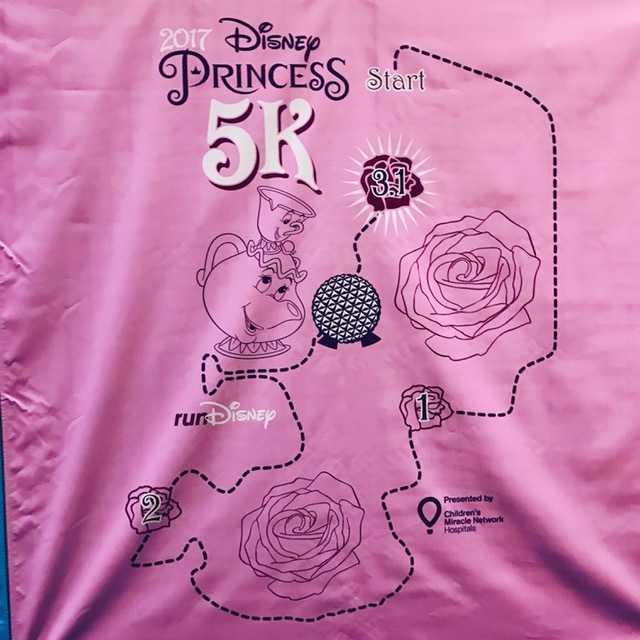 The 5K shirt was a cotton short sleeve t-shirt that was grey featuring Chip against a silhouette of Mrs. Potts. The half marathon shirt is a purple tech short sleeve t-shirt that with a pink rose and a dark purple Belle silhouette on it. I really like both logos (though I do wish the 5k shirts were tech instead of cotton). Speaking of the tech shirts, runDisney changed the cut/style of them so sizing may be different that you are used to as they are a little bigger and they run longer than the old ones. Overall I like the new style MUCH better than the old ones. Because I was running two races that were not part of the challenge I got two bag check bags so I ended up with two mini Cliff bars that never got eaten. A quick aside about he New Balance Rewards check-in. I looked all over for the QR code but could not find it. When I asked an employee they told me that it was “a Hidden Mickey.” Any Disney enthusiast would eye roll at this, including me. In the end they just gave up and told me. So, not really sure what else to say about that other than if you look for it and cannot find it, just ask! 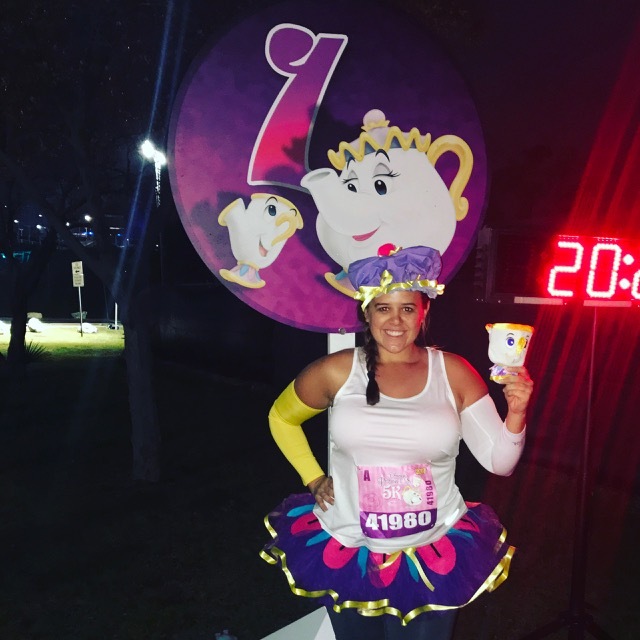 I decided to go all out for this 5K and dress as the star of the race – Mrs. Potts! Make sure to check back for a future article to give you all the details on my costume! Since we were staying off property and had our own car, this was the easiest race morning routine I think I have ever had at a runDisney race. We got up, made a small breakfast of a half of bagel and walked to the car. Traffic was light so we drove straight to the Epcot parking lot and got a spot close to the security entrance. Bag check was standard and seemed to move fairly well as they processed the large crowds. They had the typical pre-race hoopla: a DJ trying to get people to dance, long bathroom lines, bag check, and photo opportunities. I met up with some friends and we hung out for a bit before we heard the call to the corrals. I do not enjoy fighting my way to the front of the corral, so I avoid the initial rush to the corrals and fall in a few minutes later. I find it to be so much more pleasant. We met up with a few other friends once inside the corrals. runDisney has started employing an unannounced wave start, where they release only part of a corral, followed a few minutes later by more runners from the same corral and then so on until the entire corral is on the course. You may be wondering why they don’t just make smaller corrals? We don’t have an answer for you, but if anyone does, please drop us a note and let us know! 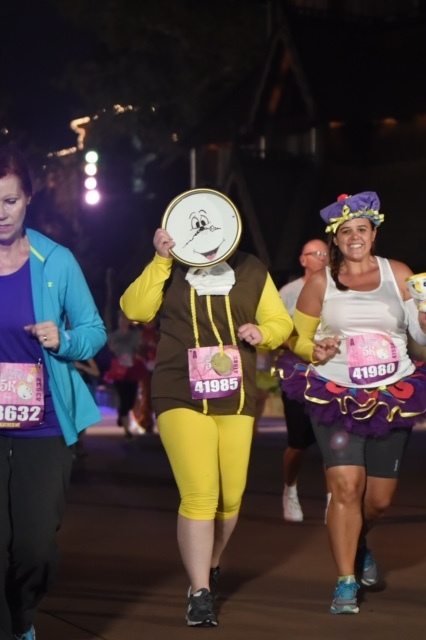 Have you ever run any 5K at Walt Disney World on any weekend besides the Wine and Dine weekend? If you answered “yes,” then you ran this course before. If you answered “no,” I’m going to give you a very brief run down of the course and focus more on the fun that was had! The course starts in the Epcot parking lots and heads east to take you to the outskirts of Epcot before making a right to head south toward the backstage entrance by Test Track. The mile one marker is right before you head underneath the outdoor part of the attraction’s elevated track. We continued running in the Epcot backstage area for a short distance before entering World Showcase between the Mexico and Norway pavilions. From there we turned left towards China to begin our journey around World Showcase. Just after the bridge between France and the United Kingdom we turned left and exited the International Gateway entrance to the park. We then made a right turn to once again head backstage in Epcot where we were greeted by the mile two marker. We then made a right turn to enter back out into World Showcase between United Kingdom and Canada and turned left to pass Canada and run toward Future World. Next we made a left hand turn that put us running directly toward Spaceship Earth. We then turned left between the Character Photo Stop and Innoventions West. Next we made a left turn toward the Imagination Pavilion, a right hand turn to run by the Land Pavilion, then another right hand turn by the Seas Pavillion (Nemo! ), then finally a left hand turn to run back thru the passageway by Innoventions West followed by a left hand turn to head toward Spaceship Earth. Yes, lots of turns in a small area. We then ran toward the right side of Space Ship Earth and exited backstage by the restrooms. The mile three marker was immediately backstage followed by the quick 0.1 mile dash to the finish line! 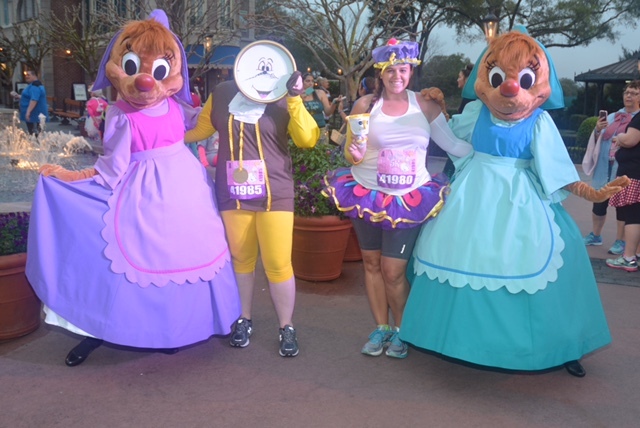 Here is a rundown of some of the fun characters who meeted and greeted us along the course! As you can see, the theme was clearly princess sidekicks. Meeko (from Pocahontas), Dopey (Snow White, a VERY popular character stop), Abu (Aladdin), Suzy & Perla (from Cinderella, pictured below), coral performers/dancers from the Finding Nemo musical stage show in Animal Kingdom. You may be wondering where Chip and Mrs. Potts were, and so were we. It is odd that runDisney would omit appearances by the event mascots. People were also stopping to take pictures with the topiaries that were set up for the Epcot Flower and Garden Festival, but there were no Photopass Photographers at these spots. Snow White, Cinderella, and provincial Belle were available pre- and post-race, but those lines were crazy long so we decided to skip them entirely. You already know that I’m going to praise this SMO since is the entire reason I signed up for this race. It is a beautiful silver medal with Mrs. Potts on it with Chip sitting on her head. The medal reads “Disney Princess 5K.” The lanyard is pink with roses, Mrs. Potts, and Chip on it. Yes, I am a fan! But why is the 5K medal so much better than the one for the half marathon? Just sayin’. We went thru the finish chute per usual for a runDisney race. We collected our water, Powerade, banana, and runDisney snack pack. We grabbed some finish line photos and it was off to the car to head back for showers and naps before some well-deserved pool and theme park time! No music today. Enjoyed run/walking with my friend Kelley and trying to take as many photos as possible in our costumes! Would I run this race again? I cannot say that I would NEVER run this race again, especially since I am signed up for Dopey 2018 and it is the same course. I do not typically run runDisney 5Ks mainly because I like my sleep. You never know though, if they want to make me SMO envious I may just run this race again.